Welcome to the third post in the rarely relevant R recommendation series, or R4 for short. Today will be brief, but of some importance. In order to know where R is going next, few places provide a better vantage point than the actual ongoing development. This shows a particularly useful day when R-devel folded into the new branch for what will be the R 3.4.0 release come April 21. The list of upcoming changes is truly impressive and quite comprehensive -- and the package registration helper, focus of posts #1 and #2 here, is but one of these many changes. One function I learned about that day is tools::CRAN_package_db(), a helper to get a single (large) data.frame with all package DESCRIPTION information. Very handy. Others may have noticed that CRAN repos now have a new top-level file PACKAGES.rds and this function does indeed just fetch it--which you could do with a similar one-liner in R-release as well. Still very handy. 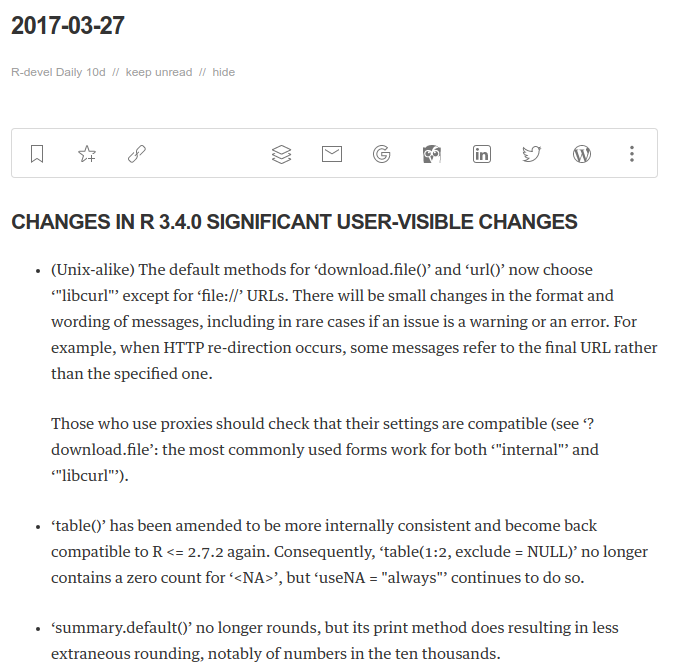 But do read about changes in R-devel and hence upcoming changes in R 3.4.0. Lots of good things coming our way.